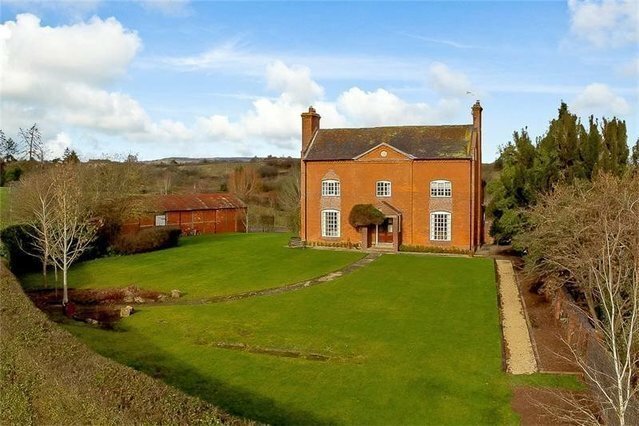 A handsome Georgian farm house in the picturesque Worcestershire countryside. Church Farm House is a striking Grade ll Listed family home which offers six bedrooms and spacious living quarters arranged over three floors. The layout of the property means a wealth of natural light and good flow. The current owners have renovated the property which now offers charm and character but with modern amenities and a stylish finish. Upon entering the property, there is a bright entrance hall with traditional tiled flooring, linking the main areas of the ground floor. To the left lies an impressive drawing room with dual aspect windows, tiled flooring and a traditional fireplace. To the right, a spacious dining room also benefits from a fireplace. Flowing through from the dining room, the gorgeous kitchen is a light and airy space, complete with tiled flooring, fitted modern appliances, an island with breakfast bar and plentiful surface and storage spaces. Further storage solutions are provided by a convenient utility room, as well as a boot room and additional storage rooms. A welcoming family room features a fireplace and wooden flooring, and doors extending the living space out onto the garden. A cloakroom completes the ground floor. On the first floor, the master bedroom is a large double bedroom, which benefits from a private dressing room and a spacious en suite with a bath. A large second bedroom also boasts a walk-in dressing room, while a third double bedroom, with built-in storage, completes the first floor. Three further generous double bedrooms are found on the second floor, completing the property. The property has extensive cellars. The house is set back from the private road, and benefits from extensive gardens and grounds to 3 sides. The driveway leads up to the property and opens into a parking area providing plenty of space for multiple vehicles. To the front of the property, a well-maintained lawn is lined to the front by a hedge, with a paved pathway leading from the door to a fence onto the road. To the rear, the property boasts additional well-maintained lawns, as well a large barn and 3 paddocks.